If you are looking for a new juicer, it is always useful to look at some reviews. In this section I have outlined the advantages of some of the best machines that are on the market at the moment, in various categories. There is no single juicer that can be called the best juicer, because this will depend heavily on your requirements and also your budget. If you are new to juicing I suggest that you read through our buying guide before you buy a juicer. The Samson juicer is an excellent single gear juicer that allows you to create delicious juices, nut butters and frozen fruit desserts. I speak from experience because this is the juicer that I have sitting in my kitchen. If you are into juicing wheatgrass, you can do this with this machine (unlike some juicers). Overall, I have been really pleased with this purchase and would happily purchase another product from the company. Also in this category are Omega juicers and the Champion juicer. 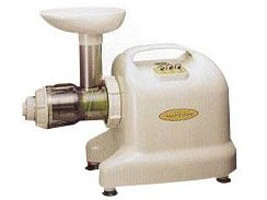 You may also hear about the Matstone juicer – this is essentially the same as a Samson juicer under a different brand name. Twin gear juicers are some of the most efficient juicers at extracting juice with maximum nutritional value. 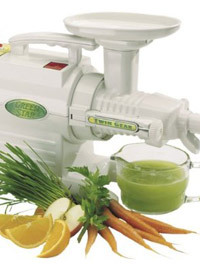 The Greenstar range of juicers is one of the most popular and has stood the test of time. Like single gear juicers, they work at relatively slow speeds and therefore do not cause oxidation of the juice. Some people find that they are quite hard to push the produce between the gears, but are worth persevering with. 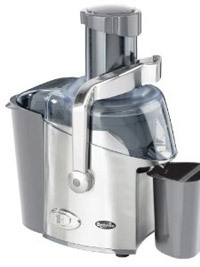 Other juicers in this category include the Norwalk juicer. Breville produce a wide range of centrifugal juicers that suit any budget. My preference is generally for machines that spin at slower speeds and therefore retain more the essential nutrients (such as single gear juicers). However centrifugal juicers have their place if you are on a budget and just want a quick drink with minimum fuss. The Breville whole fruit juicer falls into this category as you can put whole fruit such as apples into it without needing to chop them up. Other machines in this category include the Jack Lalanne juicer and Powerjuicer. Be sure to return to this page as I will be writing more juicer reviews covering the main models on the market.